Easy Green Goddess spiralized Potato Salad! 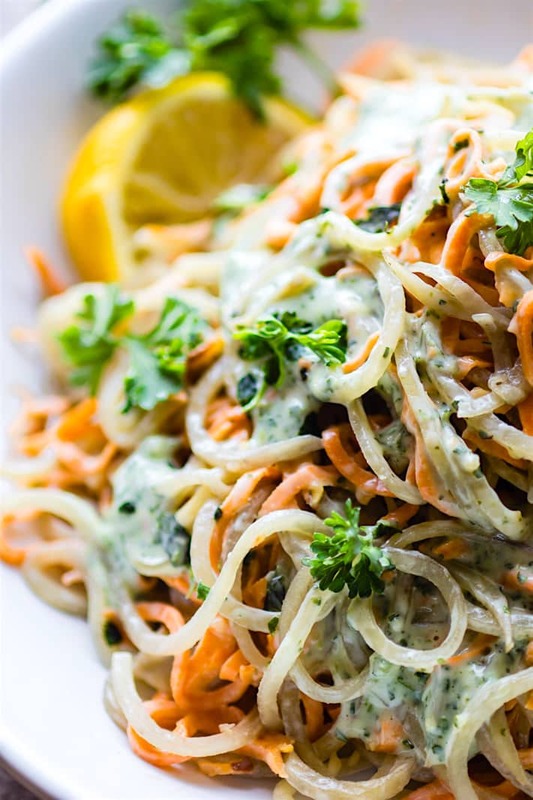 A paleo and vegan pasta style potato salad that’s so flavorful and healthy! A perfectly creamy potluck side dish. Or grab a spoon and hog this salad all for yourself! Oh hey there last week of June! Like whoa, you crept up fast! Again, old age syndrome talking about weather or time. Sorry. Habit. But really, one week till 4th of July and all the “Merica festivities. Including potluck galore! Potato salad, Burgers, Cookies, Cakes, hot dogs, and everything in between. Ahhh…. and fireworks. Which I secretly hate because it means we stay up all night trying to calm down our dog. Which then leads to a lack of sleep hangover feeling the next day. Haha… real life struggles. I’m kidding. But let’s not kid around when it comes to potato salad, or any summer salad for that matter. The perfect potato salad… not to mushy, not too creamy (in my opinion), not to “heavy,” and perfectly seasoning with herbs, spices, etc. 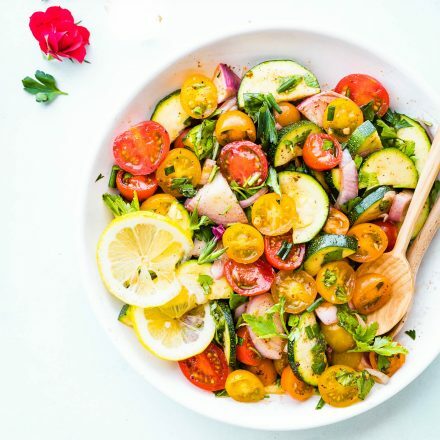 A zesty light potato salad. That’s the kind I’m aiming for today! And why this one is mayo free. Yep, a no mayo salad. Instead, we’re gonna mix it up with an herb-a-licious vegan green goddess dressing. You all know about goddess dressing right? If not, go google it ASAP or just make mine. And if you’ve never had green goddess dressing, you are missing out on life. Kidding. But it is truly AMAZING! I’m a wee bit spoiled, because in here Austin, there is a local vegetarian cafe that makes their own specialty vegan green goddess dressing. Which you can buy at whole foods or another local store. I did my best to recreate it, but still, sometimes you just can’t compete. Ya know? 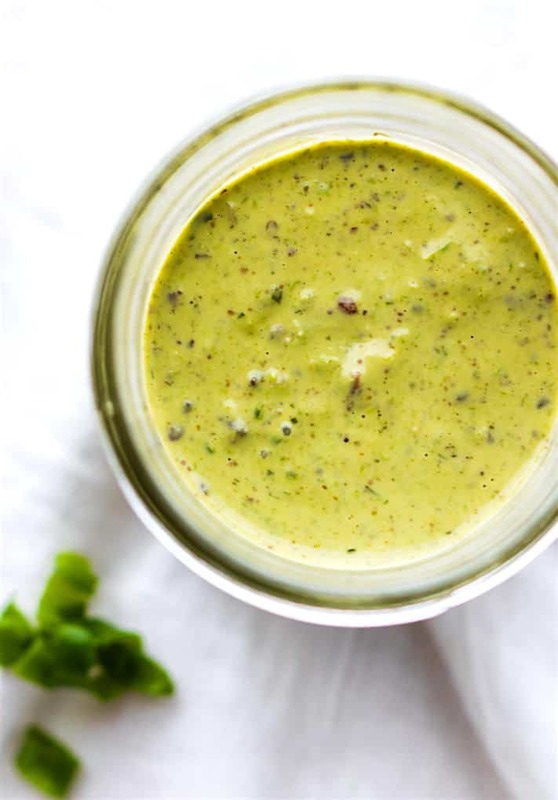 Original green goddess dressing usually contains eggs and some sort of mayo. But today I decided to switch out some of those ingredients and use seeds, coconut cream , and avocado instead. Which gave it that extra creamy flavor in vegan form. Nerdy Nutrition tip –> Eating a COOKED then COOLED starchy root vegetable with healthy fats (like this potato salad and creamy dressing) will increase the RESISTANT starch in the dish. Resistant starches (like prebiotics) ferment through the digestion process and then feed that healthy gut bacteria. Which then boosts your immune system and is said to improve blood sugar control. Nutrition Nerd out complete ya’ll! Back to potato salad. The kind that is not your mama’s but will still make ‘Merica proud. 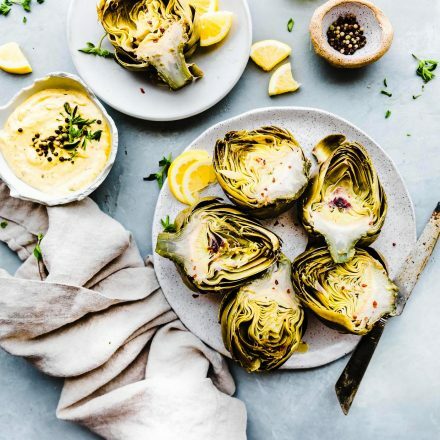 A favorite side dish (well, I’m assuming) that’s lightened up, or rather, vegan and paleo’d up. Yes, that is a word. And then SPIRALIZED. That’s a word too. Let’s call this the NEW AGE potato salad... mmm k? 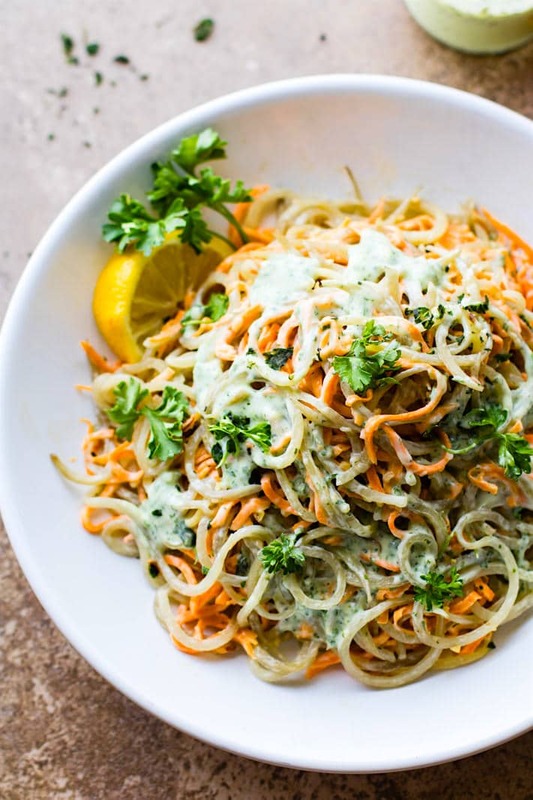 The trick to making this dish fast is to first spiralize and then steam in the microwave. It literally takes half the time to make vs boiling. BUT —> If you are wanting to make this dish ahead of time, you can just blanch your potato noodles then keep them in the fridge until you’re ready to mix it with the dressing. I’ve done that too and I love that it keeps the color fresh, ya know? So there you have it, two different types of potatoes, lots of green herbs, healthy fats and oils, and VIOLA! optional – to make thinner dressing add in 2 tbsp water or a bit more oil. 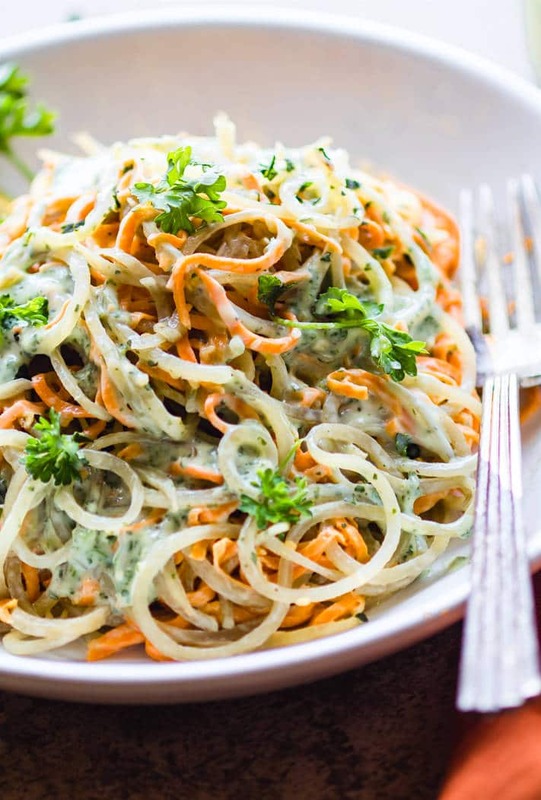 Spiralizer or peeler to make in to ribboned “pasta” style potato salad. Be sure to chop all your veggies first. Measure them out. Place everything but the oil in a food processor. Pulse or thin out. Then keep the food processor running and add in your oil slolwy. Add more onion or salt at the end if desired. notes for dressing it’s best to use a coconut drinking milk or almond milk so it doesn’t thicken to much in the fridge. But if you use coconut milk from a can, it still tastes great, just thickens in the fridge. You would need to mix it up or add water or oil to thin it out. This makes around 2/3 to 1 cup. Peel your potatoes and clean them. See notes for what to do with lefotver peels. Next spiralize or ribbon your potatoes. Place in large microwave safe bowl. Place your potatoes, water, and dash of salt in microwave and cook for 4-5 minutes or until softened but not overcooked. Remove, let cool, then add your goddess dressing. Add chopped onion on top or more parsley before serving. If you want to make ahead, I recommend baking or blanching your potato noodles first. First spiralize the potatoes. Cook the potato noodles in a pot of boiling water with sea salt for 2 minutes. Drain the noodles and place in a bowl of cold water. Alternatively, bake the potato noodles on a greased baking tray in a 400°F (204°C) oven for 10 to 15 minutes. Set aside to cool. It’s best to use a coconut drinking milk or almond milk so it doesn’t thicken to much in the fridge. But if you use coconut milk from a can, it still tastes great, just thickens in the fridge. You would need to mix it up or add water or oil to thin it out. 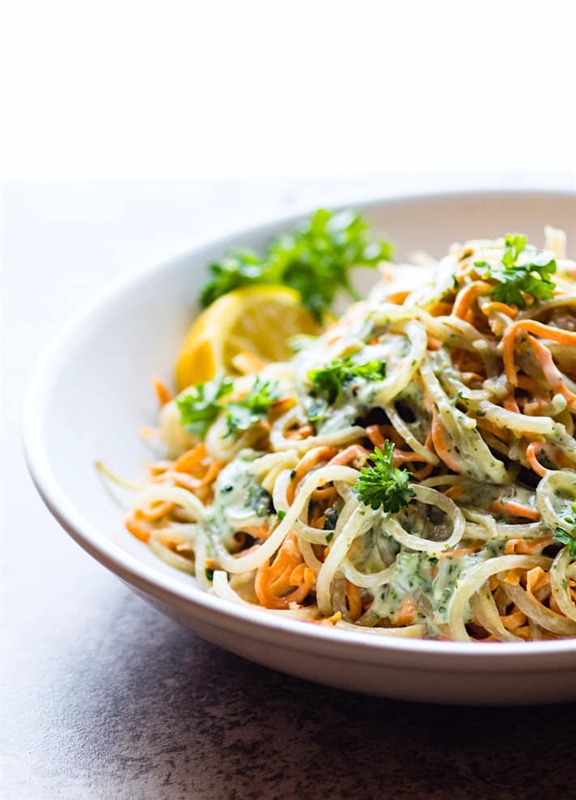 make ahead tips Spiralize or ribbon peel the potatoes then Blanch the potato salad noodles. Keep in fridge until ready to make. Then steam in microwave for a few minutes to softened. Add your dressing and serve. 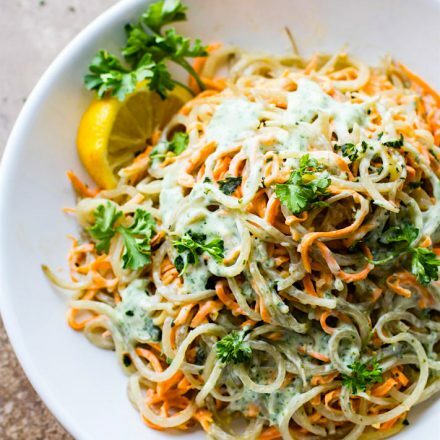 For spiralizer suggestions, see post below! Now, here’s my one dilemma. Well, two dilemmas. Do you use a spoon or a fork? Do you share or just hog the whole potato pasta noodle creamy goodness to yourself? What’s your favorite type of potato salad? Creamy or mustardy? Boy I like to make up words today. Haha! Cheers to 4th of July Count Down! Creamy UNREAL GOOD Green Goddess spiralized Potato Salad! 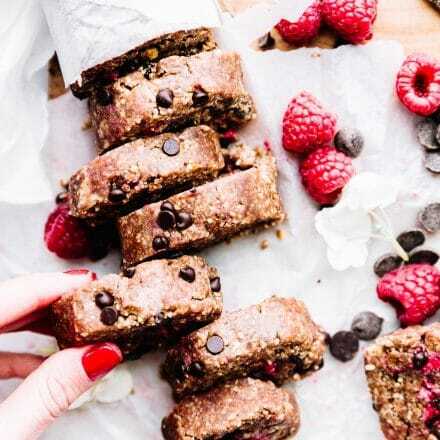 #paleo #vegan #healthy! Sweet potato, russet potato, or both? Mmmm. I say both! You know ok always down for nerdy nutrition. 🙂 I’ve never heard of that dressing so know I will definitely have to google it and try yours! 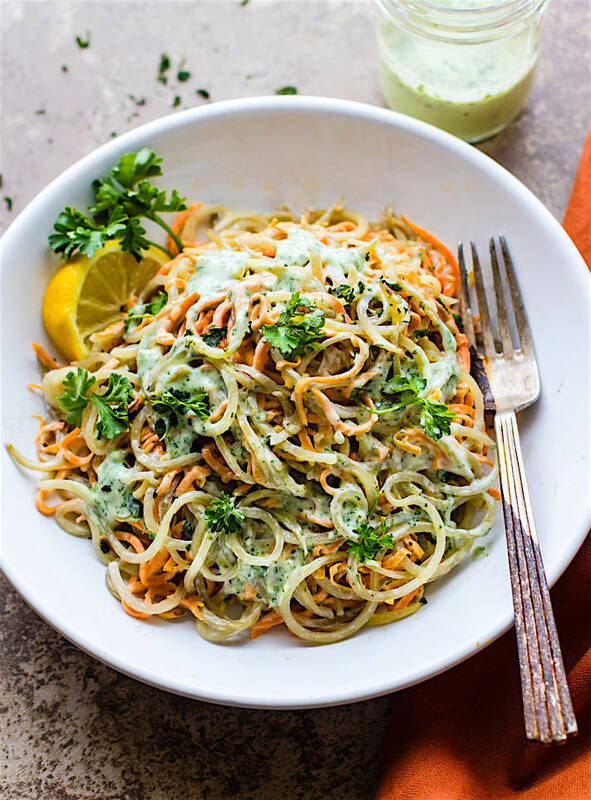 I just made sweet potato noodles for the first time yesterday and i fell in love so these green goddess version is making me swoon! yum! bring your green goddess wrap over and let’s party! Always give me the nerdy nutrition! And the sweet potatoes (although I love the combo of both regular and sweet). This looks gorgeous and delicious. First of all, this salad is gorgeous. Second of all, I love the sound of that dressing–WAY better than plain ole mayo! Never apologize for nerdy nutrition tips! I love ’em 🙂 And I’ve never been a potato salad fan solely because of the mayo, so this looks like the perfect way to give it a fair shot. The goddess dressing sounds amazing! I always learn something from you – I love your nerdiness! 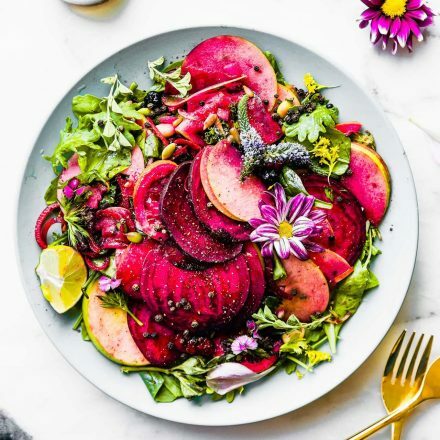 Vegas would love this AND I just said I needed to make a Green Goddess dressing – she planted an herb garden for me and I can’t use them fast enough! Yay for made up words – but, no yay for old age syndrome – I have a bad case of that syndrome these days! 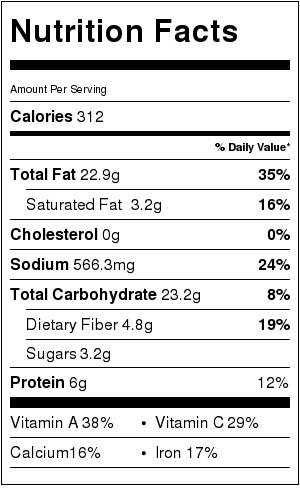 BTW – ooh this salad sounds so yum – loving the spiralized potatoes and thanks for the nerdy nutrition tip! Mmmmm…I love your new-age potato salad! Sounds like a perfect main course for me! Thank you for the nutrition tips. Now this is potato salad at it’s best. Great recipe. Such a fun twist on the classic potato salad!! I like what you said about hogging in all for yourself – that seems like the best option. 🙂 Also, loved the nerdy nutrition tip. I never knew that! This looks amaaaazing! What a clever (and fun) idea to use spiralised potatoes! I love these kind of recipes – looks so fresh and delicious!! Sounds yummy. Will get back you a review after my preparation. Hope a sweet kiss from my kids. Thanks for sharing a new recipe to us??? Love your nerdy nutrition tip. And sine I love cold potatoes, this is one salad I must try! Looks amazing as always. And as for as potatoes, give me all of them. lately though I am all about Japanese Sweet potatoes! yum! you know I agree! gimme them taters. LOL! Love everything about this. Wonderful recipe, looks absolutely fabulous. Can’t wait to try it soon!! 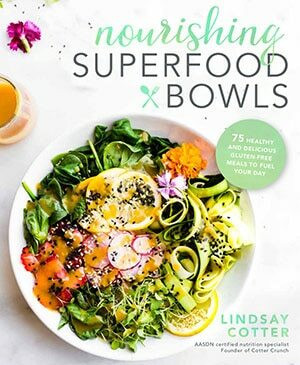 Looks great, Going to try to make the dressing as well but wondering if you have an idea to swap out the tahini which is basially oil and sesame seeds, clocking in over 400 calories for 1/3 cup. Maybe an egg and non-fat plain yogurt if dairy allowed? You sure can! I was just trying to make this vegan. I would use yogurt or egg. Either should work but I think the yogurt would be more creamy. Keep me posted! I have totally forgotten about the fact that I somewhere have spiralizer in my kitchen. Hi! Would the dressing turn out good if I used almond butter instead of cashew? Almond is what I usually have on hand. Definitely going to try to make this today! Looks so good! I’d love to make this, but we don’t have a microwave. Do you have any suggestion as to how I could otherwise prepare the potato “pasta”? 15 minutes. Set aside to cool. Absolutely delicious! I sprinkled feta cheese on top-yum! I live in Austin too – I’m curious about the local cafe that makes their own dressing which you can buy, what’s it called? Your recipe sounds delicious but I barely have time to boil an egg these days! It was at mother’s cafe on Duval. Love it! I think they sell it at wheatsville co-op now. 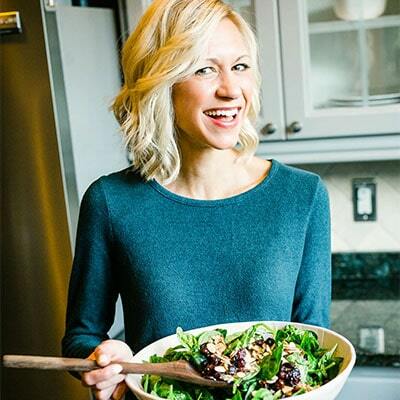 I just started following you and I am excited to learn about new recipes! I am curious, what kind of spiralizer do you use? I have one but it is not easy to use. I am looking to get a new one. Hi Dianne. Thanks so much for your comment and for connecting. I appreciate your feedback! I just recently purchased a new spiralizer from OXO. It’s been great. But I also really love the one on my shop page. I still have that one too. It’s just older. But both are great!